Okay, I get it, you’re confused. I am too. I think everyone is a bit puzzled at this point in the season for UNC men's basketball. I’m just glad this vicious cycle has spiraled back to an innocent confusion though, because as of late December (the Wofford loss), I had fear. A fear that rose as I recalled the 2009-10 UNC team — a team that started off ranked No. 6 in the preseason polls. This year's team started off No. 9 before producing some similar performances to that 09-10 team. The big difference between that team and this team? That team didn't have Luke Maye. Let me explain. Before I get comments saying that team was worse from the start, let’s take a look, shall we? In the fall of 2009, fresh off a national title back in April, UNC men's basketball was off to a torrid start. Blazing through three cupcake games before beating No. 15 Ohio State, the Tar Heels had things pretty well figured out. However, a loss to unranked Syracuse — an Orange team that would eventually rise to No. 1 — at Madison Square Garden dampened some of the aspirations of the young team. Still, they bounced back to drop No. 9 Michigan State in the Smith Center before losing yet another to No. 5 Kentucky, led by John Wall and DeMarcus Cousins, by two points in Rupp Arena. If anything, UNC should have been proud. The starting five of Deon Thompson, Ed Davis, William Graves, Larry Drew and Marcus Ginyard had navigated a tough non-conference schedule to 7-2 record thus far. But the weak spots were beginning to show. A win versus an overmatched Presbyterian was just a bright blip before a 103-90 loss to an Avery Bradley-led No. 2 Texas team at a “neutral site,” in Dallas. Even though an 8-3 record through 11 games is mediocre for the historically dominant Tar Heels, I’d be willing to bet everyone around the program was pleased. Despite losing a national player of the year in Tyler Hansbrough, a three-point legend in Wayne Ellington — the owner of Littlejohn Coliseum, anyone? — and one of the most prolific point guards in UNC history in Ty Lawson, coach Roy Williams still had his team competing in every game. The team rattled off three more convincing wins before disaster struck. On a road trip to College of Charleston, the Tar Heels were shocked by three points. This loss halted all momentum, and it ultimately may have been the spot that ripped the wheels off the 11-4 Tar Heels' already hobbled bus. UNC would go on to finish the regular season at 16-15, and 20-17 overall after losing in the ACC Tournament and winning four of five games in the NIT. But it is rather puzzling how that Tar Heel team could go from elite to cupcake in a matter of weeks. The similarities between that team and this year's team is scary, complete with the Wofford disaster. However, everything changes when you turn to the post. One of the keys to that 09-10's season was post presence. Even off the bench, a young Tyler Zeller was a key cog for that team. He missed the first 10 games of ACC play and UNC came away with a 2-8 record in that span. While still not at Tar Heel standard, UNC was substantially better with a 17-9 record in games with Zeller on the court. As scary as it is, given the system UNC runs with the post, it’s easy to become reliant on these players to get others open looks. Remember how much harder the game got whenever Isaiah Hicks got in early foul trouble a year ago? Think back in time, to the beginning of Roy’s tenure at UNC. Sean May, Tyler Hansbrough, Brendan Wright, Ed Davis, Tyler Zeller, John Henson, Brice Johnson, Kennedy Meeks, Isaiah Hicks, Tony Bradley … noticing a trend? Since he came to Carolina in 2003, Roy has brought in numerous big men who have showed NBA potential as back-to-basket players. Even Marvin Williams as a stretch-4 and Harrison Barnes — averaging nearly seven rebounds per game for the Dallas Mavericks this year — as a more post-oriented SF have played well within Roy’s system. Save for McCants (not recruited by Roy), Hairston and Paige, the Tar Heels' leading scorer has been 6-foot-8 or taller since Roy got here. In those seasons without a 6-foot-8 leader, UNC made to the Sweet 16 or better only once — a regional semifinal loss to Wisconsin in 2015. While the 2009-10 season is an outlier because of lack of talent, the trend holds that post presence is equivalent to wins in the Tar Heel system. Furthermore, some of the best seasons for UNC come with a double-digit rebounder in the post. The double-digit rebound club is an exclusive one in Roy’s tenure — Sean May (04-05), Tyler Hansbrough (07-08), John Henson (10-11), Brice Johnson (15-16), Luke Maye (17-18, through January 24) — but it is coveted. It’s also worth noting that this season may have changed Roy’s perspective. A back-to-basket style has proved less effective with one-and-done players chucking threes at a breakneck pace. Barring a few blips where the Tar Heels were front-heavy, the three-pointers attempted have risen tremendously since early in Roy's tenure. At its current pace, this year's team would top the 2016-2017 team's total by nearly two attempted threes per game. Since 2010-11, UNC has attempted 25 or more threes in 20 total games. This year's Tar Heels have produced seven of them. While it might be scary to see the Tar Heels attempting threes at the rate they have this season, it may be a necessity. UNC has won 15 of those 20 games since 10-11, including last year’s national championship game, showing that maybe this change is for the better. Sure, it has its inconsistencies, but a Hall of Fame coach like Roy recruits the type of players he needs to fit his system. Think of Coby White, Nassir Little and Rechon Black. None of them stand over 6-foot-7. Wouldn’t it be great if UNC had the perfect player to usher in this new era? A Tyler Zeller hybrid with a hint of Justin Jackson? So to answer in short, yes, they do have that perfect model in Maye. Maye is the blend of traditional big man and renovated three-point style that UNC desperately needs. While Maye has one of the more curious stat lines in recent memory, he is still the trailblazer on this novel path. As a shooter, Maye is excellent. The junior is shooting 49.2 percent on 63 attempts from deep — the third-most total attempts on this year's team and the highest percentage among players with at least 15 attempts. He also rebounds incredibly well, grabbing at least 10 rebounds in 10 of his 21 starts this season. 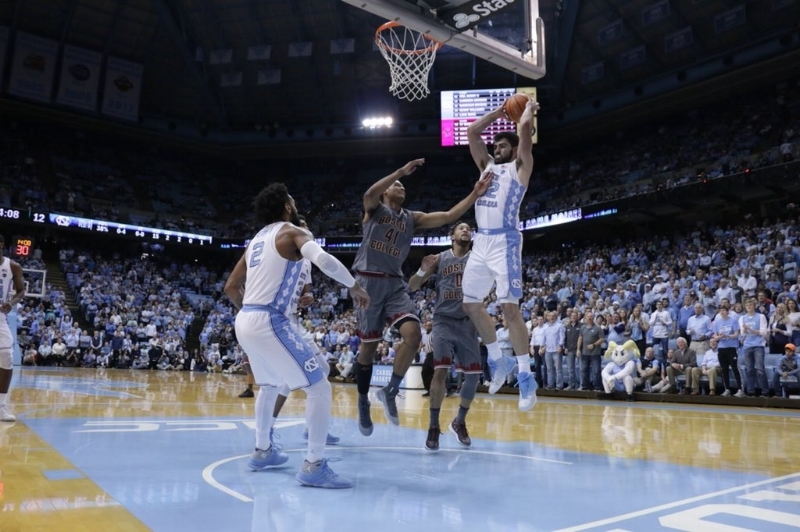 Dating back to 1992-93 season, only three Tar Heels have averaged at least 16 points and eight rebounds while also shooting 40 percent from beyond the arc: Antawn Jamison, Jerry Stackhouse and Luke Maye. Raise that three-point percentage to 43 percent, and Maye sits alone on the list. With the changing style of UNC basketball, yet the same focus on rebounds, it takes a well-rounded player to carry the torch. Maye is showing the potential to do just that. Maye does have some curious trends. He hit 16-of-40 three-point attempts in 2016-17, and he is 31-of-63 this season. Over his career he is 42-of-94 in regular-season games, and he's 6-of-16 in conference and NCAA tournament games. Here’s where it gets odd. Over his career, he has hit 10 threes in 19 attempts on Friday games. On Saturdays, however, he has nine threes over 25 attempts. His shooting is worse on weekend days by far. Setting it to this year alone to adjust for playing time, it still holds. He is 6-of-19 from deep in eight weekend games, and he's 25-of-44 in 13 weekday games. To include 2-pointers, Maye is 39-of-83 on weekends (46.9 percent) and 81-of-145 (55.9 percent) on weekdays. Even in UNC's Monday loss to Virginia Tech, Maye went 3-for-4 from deep and 7-of-12 from inside the arc. His efficiency was brilliant. Even the perfect model isn't perfect every day of the week. Sure, this UNC team may resemble that 2009-10 squad at this point in the year. But that team didn’t have Maye, the perfect intersection of Roy's love of traditional bigs and UNC's revolution from beyond the arc. Is Maye perfect? No. Is he the key to ushering in a new style and carrying this team into March? Likely. Is he a Tar Heel legend? An earlier version of this story incorrectly stated the affiliation of College of Charleston. We apologize for this error.